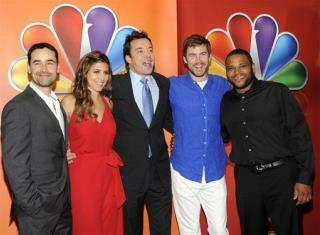 (Newser) – Guys with Kids, a new NBC sitcom produced by Jimmy Fallon and premiering tonight, seems to be a dud. "It’s a toothless junkball of a show, the sort of uninspired, reliable series a person is meant to turn on after a long day of work, so they can turn off," writes Willa Paskin at Salon. The premise, another foray into the "sad man" genre, entails three dads rearing young children as they grapple with their kids' mothers and their precarious masculinity. So it's the same as all the other sitcoms. This is not too surprising, especially since Jimmy Fallon is involved.